Now, artists of all kinds are known to have suffered lots of rejection before they became famous. To be told that your art is so simple that even children understand it may be considered insulting, but not to Ted Harrison! Ted Harrison considered this statement a true compliment and today we understand why. With clean lines and lots of color, Harrison’s work is appealing to children. 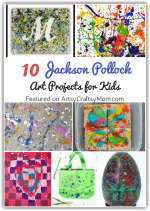 That’s why they’ll love these simple and lovely Ted Harrison Art Projects for Kids! Ted Harrison was born in England but is known for his work based on Yukon, a sparsely populated but gorgeous little territory in Canada. Harrison fell in love with the place soon after he moved there with his family, and many of his works reflect that love. His paintings depict landscapes of Yukon – the water, the people, the mountains and his favorite – the Northern flashing lights. There was a lot of detail, mostly in abstracts, and his style was to work with bold colors and definite outlines. Ted Harrison’s works have a certain positive energy radiating from them, which is probably one reason why children are easily attracted to it. They’re sure to enjoy learning more about Yukon and the flashing lights, with the help of these Ted Harrison Art Projects for Kids! Crayola has a gorgeous Ted Harrison project that uses their Dry Erase crayons and water. The result is a creamy painting where the colors seem to flow organically, rather than as if they were painted on. Let kids use complementing colors or different tones of the same color and observe how each one looks. Try a different take on Ted Harrison with this art project from Mommy Labs that uses paint glue and chalk pastels. Use the glue paint to create outlines, following Harrison’s typical irregular shapes. Then fill in with chalk pastels – a fun activity that’ll be almost meditative for high-energy kids! We know that Ted Harrison lived in Canada, which sees a good amount of snow! This project from Woojr is based on a Harrison painting called ‘Snow’. The painting features a cabin with a smoking chimney in the background and some people and birds in the foreground. You can create your own version of this with nothing more than glue and tempera paints! If you look closely, you can see that many of Ted Harrison’s works have jiggly shapes, jagged edges and curly lines – all features of a torn paper collage! This torn paper landscape project from Makes and Takes is great for the younger set. Just tear out layers from papers of different colors and arrange them on a background for a Harrison-esque picture! This fun clay project from That Artist Woman combines quite a few of Ted Harrison’s favorite things – Inukshuks, local people and the Yukon sky! You can use air drying clay for this project along with cookie cutters and other clay modelling tools. This project may require a bit of time and skill, so it’s a good pick for the older kids. One distinctive feature about Ted Harrison was that he often used unusual colors in his work. For instance the sky might be green and the whales pink. Kids will love his kind of ‘experimentation’, and this project from Rubber Boots and Elf Shoes is a great way to do it. Use black markers for those defined lines and when you’re done with the background, add some houses or people. In short, bring it to life, like Harrison did! We’ve been talking about the bold lines in Ted Harrison’s paintings, and how they added definition to his work. If you’re wondering how the little ones can get those lines, the answer is simple – use a stencil! My Small Potatoes uses a cardboard stencil and then paints over it. Then you just take off the stencil and voila – your bold lines are ready! Mosaics are an interesting way to create art, especially when it involves lots of colors and gradients, like Ted Harrison’s work. Many of Harrison’s paintings feature an orange sun and Art @ Home has a beautiful mosaic art work based on the same. Get older kids to use different shades of the same color to make a more complex mosaic. Ted Harrison was born in England and found his heart in Yukon, but in the middle he traveled widely across the world. All his experiences contributed to his art, the story of which has been beautifully captured in this book by Margriet Ruurs and Katherine Gibson. The best part of the book is of course, the pictures! The book also features a foreword by the man himself, making this a must have! Inukshuk refers to structures made of rough rock, resembling human figures. They are built by the Inuit, people of the Canadian Arctic. Inukshuks usually represent safe territory and the correct directions for travellers, especially in the old days. They are an important part of Inuit culture, so much so that it is forbidden to destroy them. Inukshuks are considered to be among the oldest and most significant man-made objects on the vast Arctic landscape. This explains why they feature so much among Ted Harrison’s work too. Kanchan Yadav’s facebook page ArtsyCraftsyOnline features some lovely Inukshuk art done by her students. She is the founder of “Artsy Craftsy”, an art training enterprise for working professionals especially ladies who want to revive their long lost love for painting. You can reach them at – www.facebook.com/artsycraftsy/online & www.artsycraftsy.in.